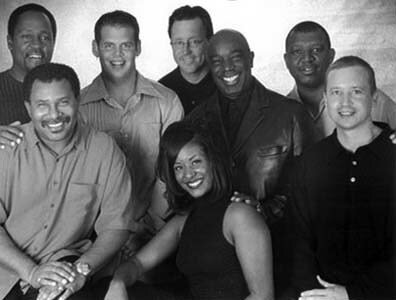 The 8 piece group showcases a distinct sound and style made famous by artists such as Earth, Wind and Fire, Aretha Franklin, Otis Redding, Al Green, Isaac Hayes, and Booker T. & the MGs. Memphis Soul Live features a solid rhythm section, fiery horns and dynamic male and female vocalists. Their style displays the rich musical legacy of the 1960s and 70s along with the current popularity of Classic Soul and R&B music. Memphis Soul also performs popular standards from Sinatra to Motown to round out its musical variety.
" The band was quick to gage their audience & reorient their playlist to ensure a successful event." "The band was awesome and enjoyed by all-from ages 17-70! They really kept the party lively and the dance floor was packed. They made the wedding reception so fun!" "You guys were the abosolute best! Our guests went on and on about how great the entertainment was. Thanks for helping to make our wedding such a memorable event." "Excellent! They had the crowd dancing! We will have them again!" "Memphis Soul Live was wonderful! I can't even count how many people told me how awesome they were. I even asked if I could get them to play all night"
"The band was great! Everyone had a blast - Fred made it easy for us. They were a pleasure to deal with." "They are talented performers and always a crowd pleaser!" "Everyone loved the band! They would have danced all night long if possible! Band had great energy - everyone had a fabulous time." "A hit at the Grand Opening of our Southlake Store...your music was well received by our audience." "Memphis Soul Live is true soul from back in the day!" "Memphis Soul Live reaches all ages, musical tastes, and social needs! I never have to worry." ----- Patty Marriott, Frito Lay, Inc.
"Memphis Soul Live is one of the finest and most professional bands I have dealt with in my years of Restaurant management!" "...Memphis Soul Live really brought our party to life; a hit with both employees and client guests!" ----- Tomeka Herod, The Wilkins Group, Inc.
"You guys were great. Awesome music and very professional. You will have continued success because you "get it"!!!"